Learn our tips and tricks for best showcasing your unique style in outfit photos—and get inspired by some of our favorite examples. Here at Dia&Co HQ, we think of spring as the official beginning of outfit-photo (or #OOTD) season. 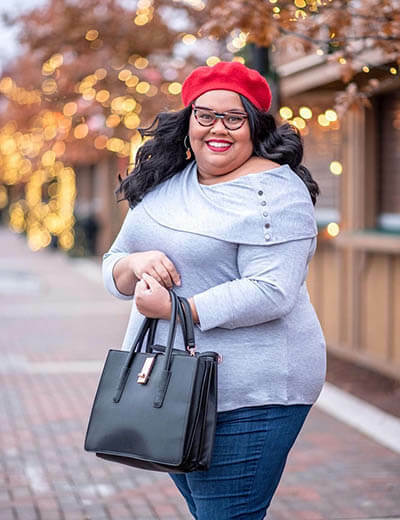 While cold weather certainly doesn’t stop us from taking photos, the rising temps open up new fashion possibilities—and make it easier to stay outside until that perfect pic is captured. 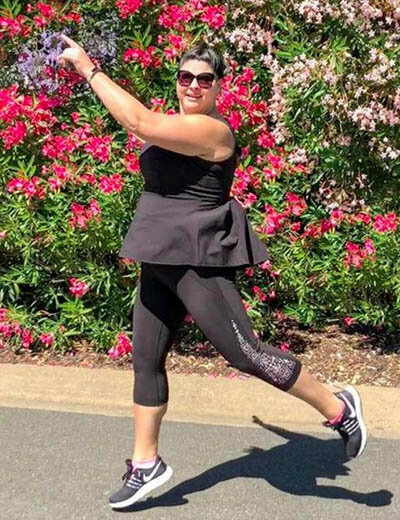 We love outfit photos so much that we started the hashtag #MyDiaStyle, so that we could see the amazing outfits all of you in the Dia Community rock each day. Selfies (with or without a mirror) may be the easiest way to snap a pic of your look, but full-body photos show off your head-to-toe style and your unique personality all at once. 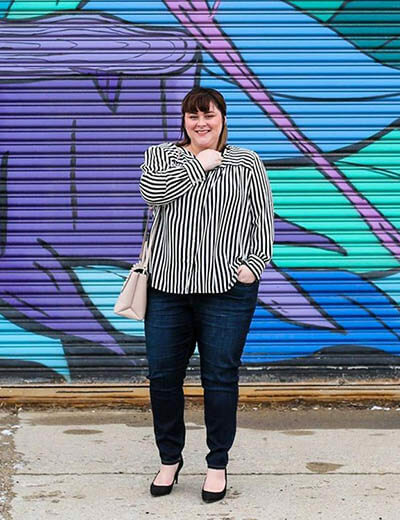 So now that the weather’s getting warmer, we’ve compiled our tips for taking #MyDiaStyle photos that give your look the moment it deserves. 1. Wear an outfit you love and feel great in. 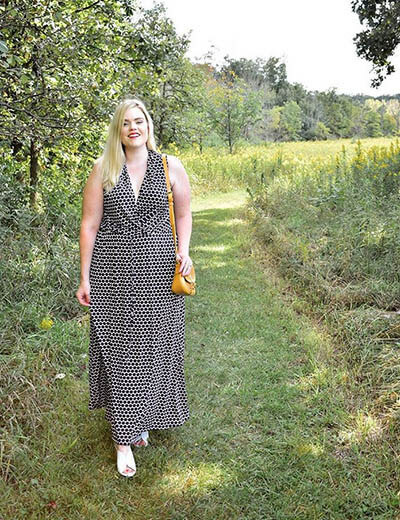 The number-one secret to taking an outfit photo you can’t wait to share is pretty simple—do it when you’re wearing something you feel absolutely amazing in. In fact, that’s what separates an outfit photo from any other great pic. In an outfit photo, it’s all about sharing your unique style with your followers. Plus, when you tag your outfit photos with #MyDiaStyle, it also gives the Dia Community great inspo for their future looks! 2. Head outdoors to take advantage of natural light. Soak up that beautiful spring weather by taking your outfit photos outside! When you opt for the outdoors over indoors while photo taking, you instantly get access to the best light. Artificial light can add a yellow tint to your photo or lower its quality. If you can’t get outside, take the photo during daylight hours and face a window to capture the most natural light possible. The best time to take photos, inside or outside, is during the “golden hour”—that period around 4pm when the light is softest. 3. Find a background that lets you take center stage. The best background for outfit photos is one that doesn’t distract from you or your ensemble. The sure-fire choice is a simple, clean backdrop without any objects in it. That said, there’s no reason you can’t spice things up with a colorful wall or beautiful landscape. Just make sure the background doesn’t pull eyes from your look—finding complementary shades and making sure you’re the most in focus will do the trick! 4. Let the posing begin! Now it’s time to let loose and have fun. If you’ve brought a friend along on your outfit-photo adventure, ask them to position the lens of their camera or smartphone at waist level so your whole look is in the frame. If you’re on your own, set a timer and prop your phone up, keeping the same frame in mind. (A pair of high heels acts as a great stand-in photographer!) The key to finding the perfect pose is moving through a series of fluid movements—the best options are ones that show off the special features of your outfit. Remember to make sure your beautiful face can be seen! Keep an eye on your favorite influencers’ Instagram grids for inspo. If you’re taking photos with a smartphone, leave space above your head and below your feet to make it easier to crop and post on social, while still showcasing your entire look. Ask your photographer to tap the screen to make sure you’re in focus before each shot. If you’re taking the photos yourself using a timer, frame the photo you want to take, then touch the screen and hold until the area where you’ll be standing is in focus. Switch up the framing to a closer crop to spotlight aspects of your outfit even more. A 3/4 shot where the bottom of the frame hits the middle of your shin is perfect! Instead of simply taking a photo that features a great outfit, tell a story! Try connecting with the environment or including friends or family in the pic. We love how @eclectickurves tells a holiday story using her environment. The angle of her body adds great movement to the photo—and the out-of-focus path in the background keeps that movement going. Seeing @roseybeeme‘s bag fly to one side makes the photo extra dynamic. Plus, since the vibrantly hued background is out of focus, it complements her look rather than distracts. In this photo, @fffabianita strikes a classic power pose with one hand on her hip and one leg crossed in front. The light gray backdrop allows the red-printed dress to really pop. 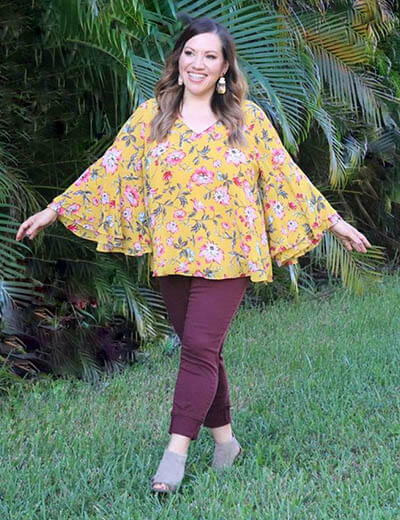 With the movement of her arms, @angelacruztube is playing up the flowy trumpet sleeves of her floral top. While the background she chose has great texture, the monochromatic green keeps your eyes on her outfit. 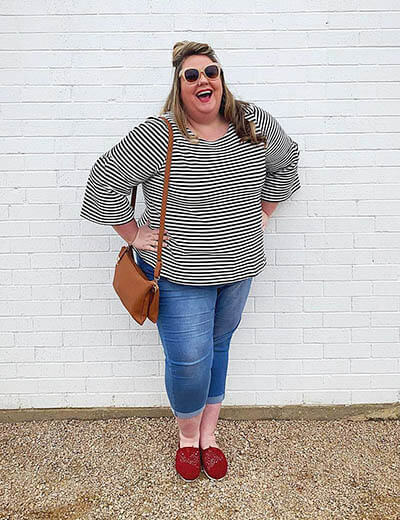 @laurenworx is keeping it classic with black, white, and denim, but the sunglasses, bag, and red flats accent the look—and make it stand out against the simple background. Plus, the ample space above, around, and below her gives her lots of cropping options! 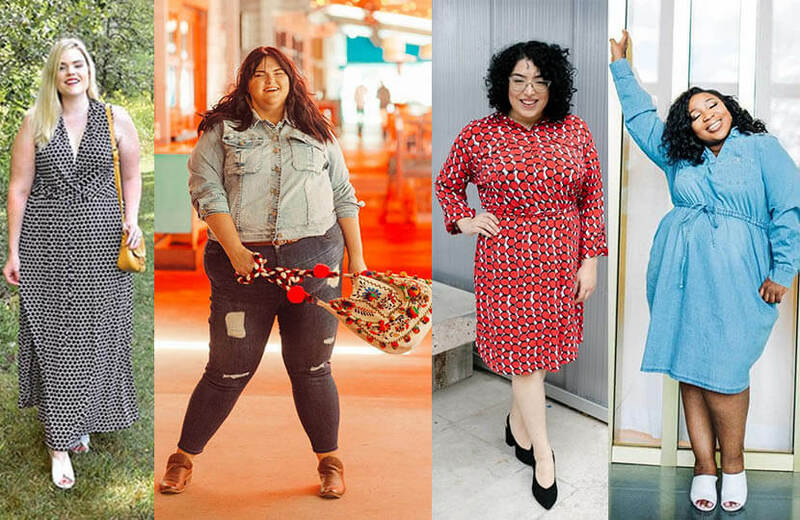 @melparrishplus is serving a great pose that flows from the top left of the photo to the bottom right—and that helps her show us how she’s fit to thrive. The gorgeous flowers behind her add color and brighten up an otherwise monochromatic look. 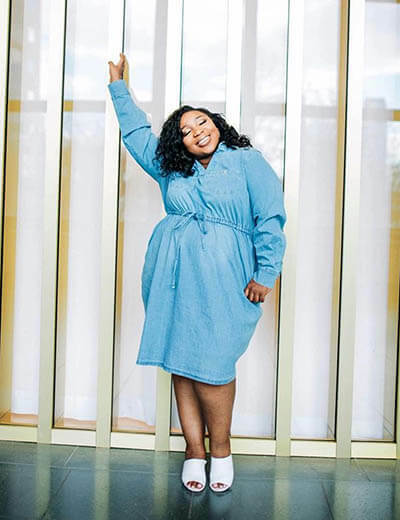 With these tips under your belt, there’s no doubt that your photos will show off the best view of your ensemble—and everything that makes you uniquely you. Use these guidelines as a starting point, then find your own outfit-photo style! Whether you squeeze in a quick photo shoot during your lunch break or plan a full-fledged session with a professional, we can’t wait to see just how fantastic you look. Want your outfit photos to be shared on Dia&Co’s Instagram? 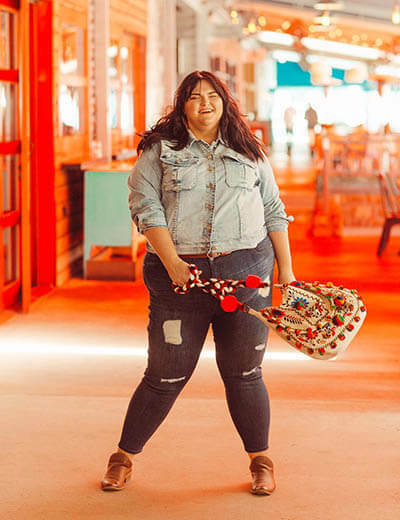 Use #MyDiaStyle for a chance to be featured!